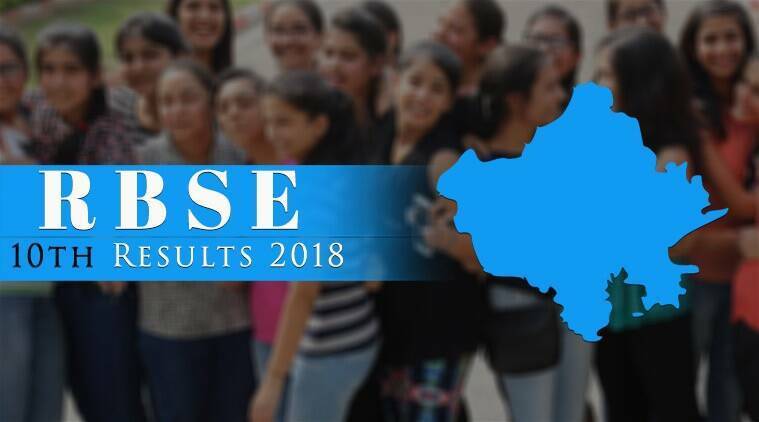 RBSE BSER 10th results 2018: The results of Rajasthan Board of Secondary Education (RBSE), Ajmer Class 10 examination has been declared today, Monday, June 10. The candidates can also check their marks through the official websites by entering their roll number. An estimate of 10,82,972 students appeared for the examination this year. Due to heavy traffic, if the websites go slow, the results can be accessed through the private website, examresults.net. In the regular student category, 80.13 per cent passed while in the private category, the pass percentage is 14.55 per cent. A total of 79.86 per cent students have passed the exam of which, the pass percentage of girls is 79.95 and that of boys is 79.79. In the Rajasthan Praveshika Pariksha, 62.51 per cent have cleared the exam. Last year, the result of SSC or Class 10 examinations were declared in June. A total of 10,72,799 students sat for the exam, out of which 4,83,282 were boys and 3,63,781 were girls. Boys had outperformed girls by scoring 79.01 per cent while girls scored a little less with 78.89 per cent. The overall pass percentage of Class 10 was 78.96 per cent. This year, there has been an astronomical rise in the number of students scoring 90 per cent and above leading to high cut-off in colleges and universities. As per reports, RBSE has since 2012, not awarded any ‘moderation’ in checking papers. Rajasthan Board of Secondary Education (RBSE) has declared the results of Class 10 examination on Monday, June 11. Around 10,82,972 students who have appeared for the examination can check the results through rajeduboard.rajasthan.gov.in, rajresults.nic.in. The result will be available at the official websites, rajeduboard.rajasthan.gov.in, rajresults.nic.in from 3:15 pm. The Rajasthan Board declared the results of Arts stream examination on June 1, 2018, and around 88.92 per cent students cleared the examination successfully. The girls have scored 91.46 per cent while boys scored a pass percentage of 86.67. A total of 5,37,260 students appeared for the exam of which 214411 got the first division, a total 225291 students scored second division while the third division has been bagged by 24864 students. This year, a total of 33564 students have flunked the exam. The results of Science, Commerce examinations were declared on May 23.